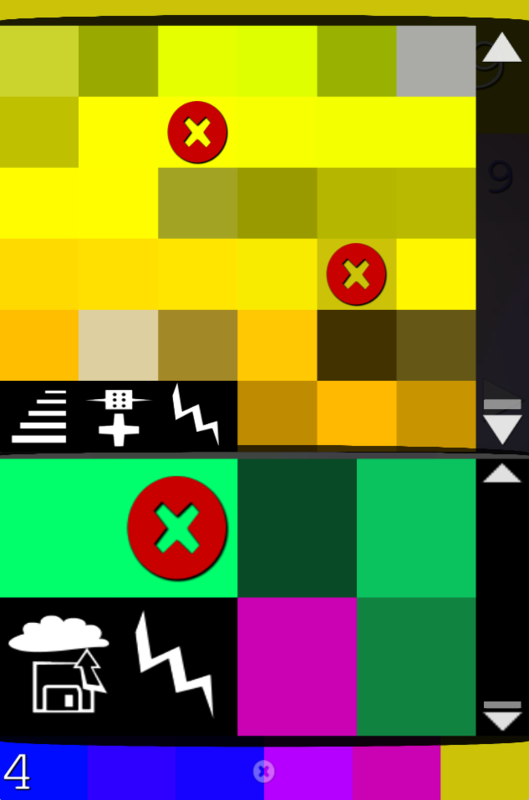 ColorPick Mobile Help - Vidsbee! By default your color history, pallete, and settings are saved when the app is minimized or hidden (for example, when you return your device to the desktop/home screen). If you want to save your work for later just leave the app. You may then close the app normally and the last state should persist. Hex and RGB for current color. Double touch to display a menu to copy the values. Zoomed Preview of current image and selected color. Drag to move or use the optional arrows. Movement speed is zoom based. Two finger pinch will zoom. If you tap this area and the Add Color to History button zooms then the color has changed. Hue Selector - temporarily moves you to a generated image for the hue you touched. A back button will appear next to the hue selector that will return to the last image. Zoom indicator - drag to zoom. Alternatively for precise control you can zoom by using 2 finger pinch method on the Zoomed Preview. When zoomed out you will be in "running on ice" mode where the velocity is increased to allow navigation on large images. Zoom in for more precise control over color selection. Add Color to History - this button picks the selected color adding it to the history. The selected colors are the basis for one of several built in mini-games once enough unique colors are collected (Extremely dark, light, and gray colors are excluded from mini-games). If you try to add the same color twice in a row you will loose all your points. History preview - this area shows the last 6 colors you added. Touch or drag this up to see the complete History & Palette Editor. Open a different image for display in the Zoomed Preview. You must allow access to your photos for this to work. When taking new photos pay special attention to lighting conditions to increase accuracy. Show the setting pane, see Settings Configuration below. History - max 8192 - This area shows the color history of all added colors with the most recently added at the top. The same color may appear twice in history - to remove duplicates you may use the "Sort and Remove Duplicates" feature. Touch these colors to add them to the palette area below. 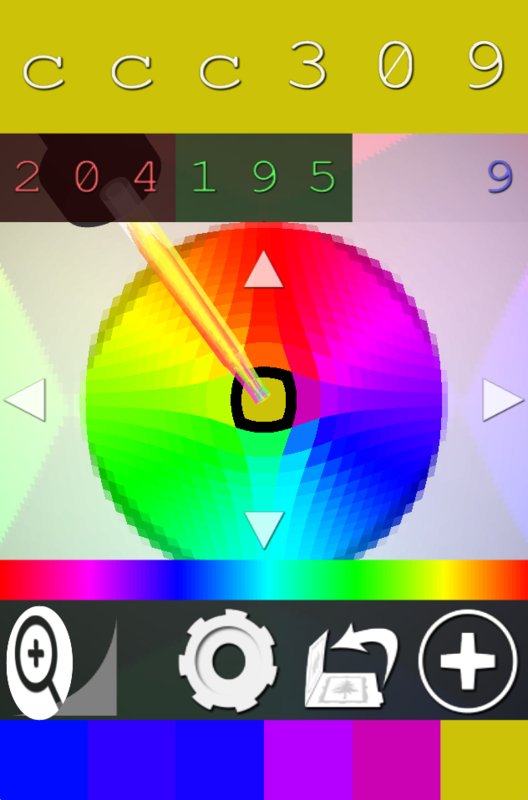 In hard mode if the color is already in the palette you will loose all your points. Sort and Remove Duplicates - this will rewrite history removing all duplicates and sorting the colors based on hue. You can drag the hue slider left or right to modify what color will show first. Points are awarded for each duplicate removed. If no change is applied the chain multiplier is reset. Adds any history colors that are not currently in the Palette to the Palette area. If no change is applied the chain multiplier is reset. Delete all history entires. This feature counts how many colors are in the history too. To delete individual history entires you may swipe to the left to reveal a delete X.
Palette swatches - max 254 - touch history colors to add them to this palette - you may not add the same color twice. If you touch colors that are in the palette the Hex and RGB values will be revealed. To dismiss the revealed color you can touch the same palette color again or drag the revealed color down (or to the right in landscape mode). Touching the ColorPick icon will start the Hue Selector and allow you to pick a new similar color. The closest possible match is selected where "> <" or "[ ]" indicate an exact match. Points are awarded for how far we moved from the start point or how far mismatched the closest match is. The rare "> <" (no move match) only awards one point. Delete all palette colors. This feature counts how many colors are in the palette too. To delete individual palette entires you may swipe to the left to reveal a delete X. Close the History & Palette Editor and return. It is also possible to swipe downwards here or anywhere on the History & Palette Editor (2x provided the scroll is at the top) to dismiss this view in portrait mode. In landscape mode you may swipe to the right instead of down. The number displayed to the left of the close X is the currently collected points. Control settings and return to the default image.